Pedal cars are kid-powered, scaled down vehicles operated by pushing pedals. Vintage pedal cars were geared for 2- to 6-year-old children, and were usually ridden in driveways and down sidewalks. It took a little work on the part of the child to propel them, but that was half the fun. Unlike a lot of today’s toys, pedal cars did not have a motor, a battery or a computer chip. 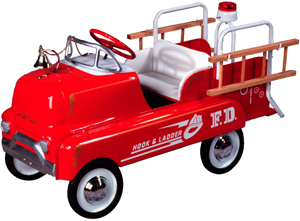 My brother had a beautiful, red hook & ladder fire truck pedal car. Part of the joy of pedal cars was that they were made with heavy metal and shiny paint like our dad’s car. Pedal cars – with their heavy metal and shiny paint – evolved along side full-size cars, even imitating the colors, lines and looks. The major manufacturers of pedal cars were American National, Gendron, Steelcraft, Garton, Murray, AMF and Todeo Wheel. In the ’20s and ’30s, pedal cars were typically enjoyed only by the wealthier classes. In the postwar prosperity of the 1950s, pedal cars became a more common sight, and if you didn’t have one, you probably knew someone that did. In their heyday, the metal pedal cars were outfitted with accessories like battery-operated lights, horns, chrome detailing, wide whitewall tires and custom paint jobs. In the 1970s, plastic models replaced the formerly steel pedal cars, and they no longer resembled what dad was driving. Today, pedal cars have moved from the sidewalk into gamerooms, livingrooms and offices of collectors. Because of their former outdoor use, a pedal car in good, original condition is very difficult to find. Especially difficult to find are pre-WWII models, since these would have been collected in metal drives and melted down to contribute to the war effort. Depending on their condition, a new or even a restored pedal car can run several hundred dollars to a few thousand dollars. Replica cars, however, are quite affordable and have become increasingly desirable and collectible.